I've been asked from time to time to point up the differences between the current, American-made Ithaca Model 37 Featherlights and the Japanese-made (Miroku) Browning BPS models. Though I'm not attempting to be all-inclusive, this should give you an idea of the primary differences. The common denominator is the bottom-ejection as introduced on the Remington Model 17 (offered in 20 gauge only) which became the Ithaca Model 37 after modifications, produced in 20, 16, and 12 gauge. The 28 gauge M37, reviewed elsewhere on this site, is a recent Ithaca innovation on its own unique receiver. With the exception of the bottom ejection platform, the BPS is vastly different from the Ithaca Model 37. The trigger group is pinned into place, the slide release is on the left rear of the trigger guard, the slip-fit barrel has a barrel extension and tab array, and the safety is a thumb safety on top of the receiver. The Browning BPS has a plain receiver, the standard models lacking any engraving. Standard models have no engraving as in the case of the "Hunter" model shown above. Current Ithaca M37s have machine-cut engraving. The BPS comes in three basic platforms: 10 gauge, 12 gauge, and everything else. The Ithaca M37 comes in four flavors: 12, 16, 20, and 28 gauge. Ithaca Featherlight models are all-steel, but weigh in the area of half to three quarters of a pound less than their BPS counterparts. Those who seek even lighter field guns can opt for the field barrel, or plain-barreled versions of the Ithaca M37 that drop significant barrel weight. Ithaca also offers the alloy-receiver Ultralight M37 in 12 and 20 gauge that is substantially lighter yet. If you are one of those folks that think that shotguns just can't be too light, then the Ultralight with a field barrel may be your ticket. The safety on a BPS is a thumb safety. The safety on an Ithaca M37 is at the back of the trigger guard and is reversible for left-handed shooters. The BPS has a raised rib, the M37 has a ventilated rib closer to the barrel. The lighter, more sculpted steel Ithaca M37 receiver is machine-engraved, the oversized slide release is at the front of the trigger guard, with the safety is at the rear. The barrel is positively attached to the receiver with interrupted threads. The barrels have elongated forcing cones and are not soldered or brazed. The bolt is jeweled and the forearm is dramatically lighter and trimmer than the BPS counterpart. The current Ithaca M37 has Ithaca's solderless barrel system. Rather than the common practice of soldering on barrel lugs than re-straightening the crimped or warped barrel, Ithaca barrels have lugs that are machined as one piece from 4140 chrome moly steel, with no heat applied to the barrel after machining. The lugs are integral, so they need no be applied later on in the process, and no warping of the barrel can occur. The ventilated rib on an Ithaca slides on and off effortlessly, easy to replace, being held on by a screw. The barrel on an Ithaca Model 37 is threaded into the receiver, with both the receiver and the barrel machined with interrupted threads. This unitizes the assembly, with no rattle or twisting possible in the threaded barrel approach. Centerfire rifles all have threaded barrels; threaded barrels are what has given the Ithaca models the reputation for accuracy that they have as slug guns. Several Ithaca M37s come with drilled and tapped receivers for scope or other optic mounting whether for turkey hunting or if you decide to screw on a rifled barrel for slug use. Threaded steel into threaded steel makes for a more rigid assembly than a slip-fit approach. Most pumps, including the BPS, and most autoloaders today have barrel extensions on the barrel that go into the receiver. As a result, particularly with a slide action, you can get unwanted barrel movement that surfaces as stick-slip. You also get wear from the barrel extension pounding itself into the receiver with every shot. The reason for a barrel extension in the first place is to reduce cost. Machining interrupted threads into the barrel and in the receiver is a costly and precise process. The Winchester Model 12, the Perfect Repeater had threaded barrels as well. However, one of the issues with the Winchester Model 12 was the lack of a barrel lug. Instead, to keep the barrel snug with the receiver you had to fiddle with the notches in the adjusting sleeve. If you ran out of adjustment, heavy draw adjustment sleeves could be ordered to further compensate for wear. Positive engagement by threads ensures precise alignment, alignment not possible with a slip fit array. To attempt to compensate for misaligned or slightly eccentric barrels, dual action bars have been used. Ironically, the slickest slide actions ever made, including the Model 12 and the Model 37 have only one action bar. To partially compensate for the twisting and binding of the barrel, the BPS has a barrel tab that protrudes from the top of barrel extension and slips into the top of the receiver. Japanese BPS models presently use the familiar Invector and Invector Plus choke tubes contingent on gauge. American Ithaca barrels are standard dimensions, use Ithaca-Briley chokes, and have elongated forcing cones. The Ithaca M37 shotguns have slimmer forearms than the BPS and come with ground Pachmayr Decelerator pads rather than hard plastic buttplates. Most slide actions today have plastic or aluminum trigger guards whereas the Ithaca remains all-steel. Rather than a bolt locking onto a barrel extension, the Ithaca bolt locks directly into the steel receiver. I've likely overlooked some areas. The fundamental key to the Ithaca's durability and light weight comes not from using weaker materials or design changes employed solely to cut machining cost, but rather from closely-fitted all-steel components that are profiled, lightened, and sculpted to reduce weight without sacrificing strength of the parent metal or original design. 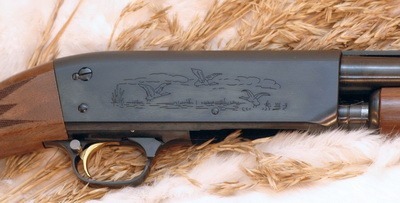 The Miroku BPS, introduced in 1977, is a successful model. The way it is made is formed of considerations to reduce machining and associated manufacturing costs in large measure.